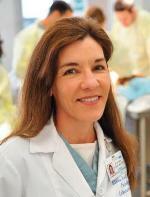 Dr. Stark joined the Department of Pathology in January of 2006. She came to UCLA as a Fulbright Scholar and had a Research appointment at the UCLA Center for Health Sciences - Neuropsychiatric Institute from 1990 until 2006. Dr. Stark is currently Vice Chair for Medical and Dental Education in the Department of Pathology and Laboratory Medicine, Chair of Anatomy and Histopathology and Director of the Anatomy Division in the David Geffen School of Medicine at UCLA. She is the Chair of the Admissions Policy and Oversight Committee. She is a member of the Professionalism Council in the School of Medicine, the Pathology Executive Committee, and the Anatomical Material Review Committees. She is Director of Undergraduate Education for the Donated Body Program, Office of the Dean. She is the faculty sponsor for the Pathology and the Ultrasound Interest Groups and for Anatomy Academy. Dr. Stark’s research interests include 1) the development of 3D animated anatomical models to enhance the medical curriculum, and 2) the field of translational anatomy specifically in depth studies of anatomical structures with novel surgical/interventional applications, for example the study of the cervical sympathetic chain as it relates to superior cervical ganglion anesthetic blockade; the study of the lumbar nervous plexus as it relates to alleviating possible sequelae of surgical hernia repair; and the study of cervical plexus structures as they relate to possible improvements in larynx transplant outcomes.